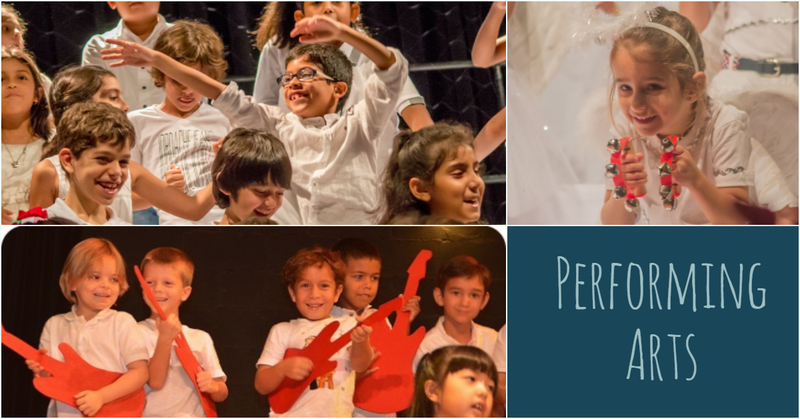 The Performing Arts program provides an active, hands-on, engaging and fun environment for all students PK3 to Grade 4. It is a happy place where students enjoy the lessons, whether it be moving and dancing or learning about Vivaldi’s Four Seasons. Our classroom is always an exciting and interesting place. We learn to listen to the beat, rhythm and tune in music and use un-tuned percussions such as drums, tambourines, and shakers. Our voices serve us as our main instrument when we practice singing together. We learn drama and dance skills, which we use in performances. We learn how to perform in front of an audience by working on our postures and expressions. We travel through time by learning about the lives of composers such as Mozart, Bach, Beethoven, and Strauss. We use Google Earth while learning folk dances from different regions of the world and learn about their cultures. We learn locomotor and non-locomotor movement as we learn these dances. All of these different methods of interacting with music allow students to think and learn in a different way. We always strive for there to be a connection, a moment, a spark, that music brings into the lives and learning of our students.